Chris graduated from the U.S. Coast Guard Academy in 2011 with a BS in Management. He served as a Deck Watch Officer onboard USCGC SHERMAN in San Diego, CA, completing multiple Eastern Pacific counter-drug and Bering Sea fisheries enforcement patrols. 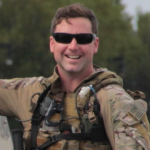 In 2013, Chris received assignment to the Coast Guard’s Maritime Security Response Team in Chesapeake, VA, where he served as a Direct Action Section Assault Force Commander and Deployable Team Leader. He will be joining New York University’s Stern School of Business in fall 2017 as a Fertitta Veterans Program Scholar and looks forward to helping other veterans with their transition process.